The main objective of this study was to gauge preparedness in math with achievement in first semester math for the fall 2005 intake of Manufacturing Sciences Division post-secondary program students. The data used to measure this level of preparedness was gleaned from students’ high school Grade 12 (new and old curriculum) or Ontario Academic Credit (OAC) math marks and the results of a diagnostic test given to students during the first week of the fall semester. In addition, success in first semester math was analyzed in relation to the specific high school math course taken. The findings of this study demonstrate that high school math marks alone are a poor predictor of performance in first semester math. In addition, students emerging from the new curriculum Grade 12 Math for College and Apprenticeship (MAP4C) failed first semester math at nearly three times the rate of all other course groupings combined. Conversely, students emerging from any of the university stream high school Grade 12 math courses or the college stream Math for Technology (MCT4C) were best prepared for college math in Manufacturing Sciences Division post-secondary programs. The diagnostic test marks were not a reliable predictor of individual student success (or “at risk” behaviour) in first semester. However, students falling into the fortieth percentile or lower groupings on the test showed a marked increase in tendency towards “at risk” behaviour or failure. Technician stream students as a group exhibited a failure rate that was double that of the technology stream group. It is recommended that the administration of the diagnostic test be continued by the college and that tracking of these indicators be carried out annually in order to monitor these trends. In addition, it is recommended that students at the high school level are made aware of the need to take Grade 12 Math for Technology (MCT4C) as a minimum preparation for success in Manufacturing Sciences Division math courses. The questions raised in this study concerning differences in performance according to gender and stream warrant further study. The subject of mathematics has long been considered an important indicator of potential student success in all levels of education. During the first week of the Fall 2005 term at Fanshawe College, a mathematics diagnostic test was administered to all math classes of Technician and Technology streams in the Manufacturing Sciences Division. The goal of this study was to find meaningful correlations between college first semester math grades and the marks students achieved on both the diagnostic test and in senior high school math courses. 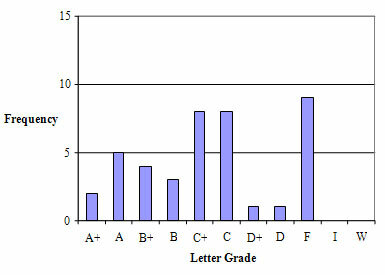 The results of this diagnostic test were correlated with students’ fourth or fifth year high school math marks and first semester Fanshawe College math grades in an attempt to identify trends relating to student success in first semester math courses as well as other program courses by Grade Point Average (GPA). In addition, there have been significant changes to the Ontario high school mathematics curriculum. Data collection was carried out with a view to providing useful information towards the current curriculum revision which is being undertaken for all technician and technology programs within the Manufacturing Sciences Division. No testing outside of the Manufacturing Sciences Division was carried out. The diagnostic test used was developed at Fanshawe College. Accordingly, no comparison with similar work carried out at other colleges was attempted. Performance in mathematics and English has been viewed as an indicator of potential for student success in college. A smooth transition between high school mathematics courses and first semester Fanshawe College math courses had existed under the old curriculum. Previous to 2003, it was recommended that students entering technology programs at Fanshawe College have Grade 12 Advanced Level Math (MAT4A) or better and that technicians apply with Grade 12 General Level Math (MTT4G) or better. Many students had also completed an additional (OAC) year. The Ontario high school mathematics program revision process was initiated during the late nineties with the implementation of new courses beginning in the fall term of 1999. The first group of students having taken new curriculum courses graduated from high school in 2003. To date (2006), there have been two minor revisions of new curriculum math courses and pathways since 1999. The need to study the impact of these changes in the math curriculum and their effect on student success at college became apparent. As a result, academic tracking of first semester Manufacturing Sciences Division students was undertaken in the Fall of 2005. Since 2003, students graduating from high school have been entering college with the new curriculum mathematics courses (see Table 1.1). Fanshawe College is still in a transition period with respect to mathematics prerequisites due to the intake of mature students who have a variety of old curriculum mathematics courses ( see Table 1.2 ). Currently, far fewer students graduate from high school with Math for College Technology (MCT4C) than students with Math for College and Apprenticeship (MAP4C). As a result, most colleges including Fanshawe College have been accepting students with MAP4C as well as MCT4C (and higher level math courses). At the moment, Fanshawe College and most other colleges specify MAP4C or MCT4C mathematics courses as the minimum requirement for acceptance into post- secondary technician and technology programs. The Fall 2005 intake for Manufacturing Sciences Division post-secondary programs was 386 students. Of this number, 278 students (72 % of the total intake group) entered with one or more of the new curriculum Grade 12 mathematics courses (includes both college and university stream courses). Of this subgroup, 196 students (51% of the total intake group) had one of either of the acceptable college stream courses. First year candidates entering Manufacturing Sciences Division post-secondary programs generally had one or more of the following: an old curriculum Grade 12 math course, a new curriculum Grade 12 math course or an OAC math course. In studies involving correlations of a students’ high school math mark with other parameters, the best mark in any one of these courses was used. 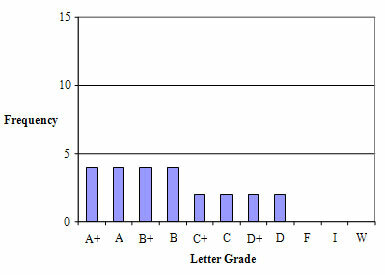 The course in which the student achieved this mark was used in studies that involved a comparison of high school math courses. These courses are referred to throughout this report as “year 4/5” math courses. Diagnostic tests were administered to students of all first semester math classes within technician and technology streams of the Manufacturing Sciences Division during the first week of classes in the Fall of 2005. Of the 386 students registered in Manufacturing Sciences Division post-secondary programs, 329 took the diagnostic test. The tests were given during a two hour period and invigilated by math professors in the division during regular class time. The programs involved in the diagnostic testing along with the number of students from each program who wrote the test are given in table 1.3 below. Each student was given two tests. The first of these tests (Part 1) dealt with basic arithmetic skills such as operations with integers, numeric fractions, decimals and percentages and associated simple word problems. Part 1 was completed without the aid of an electronic calculator. Students handed in Part 1 of the test upon completion and requested the second part. There was no time limit imposed for Part 1 of the diagnostic test. The second test (Part 2) covered a wide range of algebra skills, word problems, geometry and trigonometry. An electronic calculator was allowed and recommended for Part 2 of the test. The two tests were colour coded to facilitate invigilation. Students were given no prior notice of the administration of this test. Students were made aware, at the beginning of the test, that the results would be analyzed as part of a research project and that no credit towards a final first semester math grade would be derived from this test. Test marks were compiled on Parts 1 and 2 separately, as well as a combined mark on both parts. Further, for the purpose of marking and analysis, the tests were subdivided by skill type. Part 1 of the test was subdivided into 3 sections or skill groupings while Part 2 was subdivided into 17 sections. Student marks on each of these sections were recorded and analyzed. 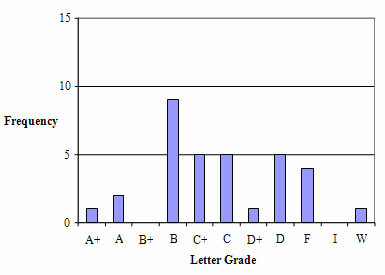 Mean diagnostic test marks, for the group, were computed for each grade category (Table 2.1). 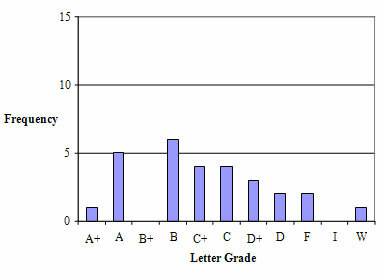 These average marks show the expected trend of a positive correlation of test marks with math grades. Dispersion statistics of range and standard deviation were also computed for each category. 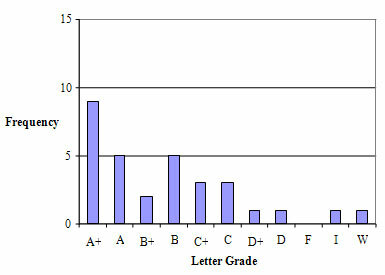 The range and standard deviation are large for each category indicating that success of individual students is not predictable using diagnostic testing in this format. For the purpose of comparing diagnostic test marks with first semester math achievement, the overall body of marks from both parts of the diagnostic test were transformed as a percentile ranking (Figures 2.1 a-j). This ranking was subdivided as decile groupings. 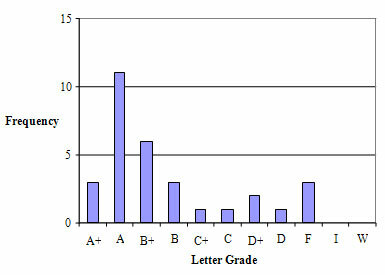 Within each decile grouping, frequencies of letter grades were tabulated and presented as histograms. 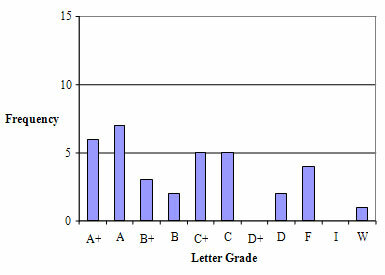 The highest four decile groupings exhibit a strong trend of first semester math grades towards the upper end of the grade scale. The remaining (lower) deciles show mixed results with significant numbers of students still achieving high first semester math grades. However, the lowest four decile groupings show a significantly larger proportion of students performing in the D and F range in first semester college math. In this case, the diagnostic test results provide a useful indicator of potential "at risk" behaviour for a significant sample of students in first semester. This information, provided early in the term, would provide useful feedback to both the student and teacher. The correlation between diagnostic test scores and first semester program success as measured by GPA is moderately weak and thus the test is not a reliable predictor of individual success. However, as a group, the diagnostic test mark was a better indicator of first semester math success than the students’ best high school year 4/5 math marks. The majority (77%) of first semester candidates entered Manufacturing Sciences Division post-secondary programs with one or more “new” curriculum (Grade 12) math courses. Students emerging from university stream courses (MCB4U, MGA4U, MDM4U) and Math for Technology (MCT4C) were best prepared for success in first semester college math. In the Manufacturing Sciences Division Fall 2005 intake, 140 students had emerged from the Grade 12 course Math for College and Apprenticeship (MAP4C). Of all 10 possible prerequisite high school Grade 12/OAC math course groups, this was the largest. This group exhibited both the highest group average (74%) in MAP4C compared to all other admissible high school Grade 12/OAC math course groupings but also the highest failure rate (20.7%) in first semester college math. The average first semester college math failure rate for all other groups was 7.3%. In addition, the students who took MAP4C make up a large proportion of the group who achieved first semester math grades in the lower portion of the grade range (D to C+). 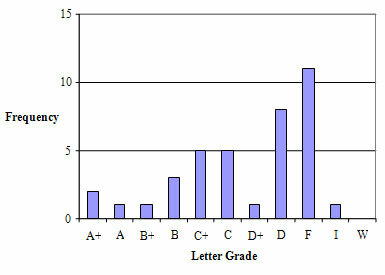 The group of students (n = 56) who took Math for Technology (MCT4C) exhibited the lowest failure rate (0%) of any group with a significant sample size. The correlation of Grade 12/OAC marks with first semester program GPA is also weak. Based on these weak links, high school math marks are not a reliable indicator of success in first semester math or overall program grade outcomes. The Grade 12 high school math course MAP4C was not an effective preparation for entry into first semester college math in Manufacturing Sciences Division post-secondary programs in 2005. There were 250 students registered in technician stream programs versus 136 students in technology stream programs. 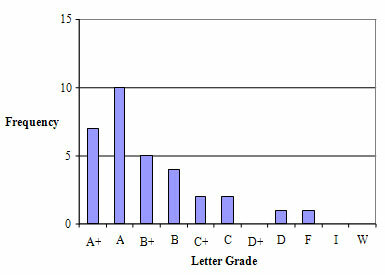 As a proportion of their group, a higher percentage of technology stream students attained math grades in the upper levels of the grade range (A+, A, B+) than the technician group. Conversely, the rate of failure of technician stream students is proportionately more than double the rate for first semester technology stream students. In general, the students who consider themselves capable of tackling a technology program have an easier transition between high school math and college math. For example, the technology students who have taken MAP4C (College and Apprenticeship Math) have a group average in that course which is 6.3 % higher than the corresponding group of technician students. The disparity in failure rates also indicates that the high school candidates for technician programs might not be aware of the level of challenge of first semester math and the degree to which mathematics runs through other first semester program courses. There is a strong positive correlation between first semester program GPA and success in student’s first semester math course. This is expected since math grade points are included in the overall GPA. The measurement of math grade points and a grade point average based on remaining courses was not performed. The results of diagnostic testing cannot predict individual student success (or “at risk” behaviour) according to this study. However, the decile rankings of students scores on the diagnostic test indicates that the test is of some value to communicate potential "at risk" behaviour to both students and teachers. This study found that the groups of students falling into the bottom four deciles of the diagnostic test rankings were most likely to either fail first semester math or exhibit “at risk” behaviour. Further diagnostic testing would examine the reliability of this conclusion. This early warning with respect to potential difficulties in math allows both student and teacher the opportunity to engage additional resources to ensure success in college math. the Heads of Technology agreed that all technology programs across the province change technology program requirements for MCT4C from “recommended” to “required” within a period of two years. Why did some students who performed poorly on the diagnostic test have significant success in first semester math? 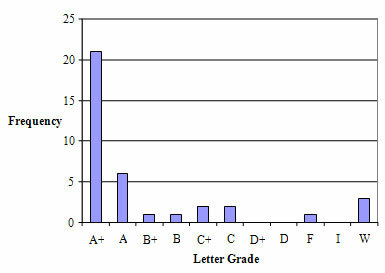 Conversely, why did some students who performed well on the diagnostic test achieve low math grades in first semester? Why are male students far more likely to fail math or withdraw from their course/program than female students during first semester? Why is the failure rate in first semester math for students enrolled in technician programs proportionately double the rate for students in technology programs? Why did the group of students who withdrew from programs during first semester have the highest average diagnostic test score? Would the results of this study hold true for the other College School of Technology Divisions/programs? an analysis of the effectiveness of college preparatory programs in preparing students for post-secondary technology programs. Fanshawe College Department of Institutional Research and Planning (2005). Student Application, Progression, and Achievement Summary Reports for 2005. Triola, M. F., Goodman, W. M., & Law, R. (2000). Elementary Statistics, 2nd Ed. Toronto: Addison, Wesley and Longman. Vogt, W. P. (2005). Dictionary of Statistics and Methodology: A Nontechnical Guide for the Social Sciences. Thousand Oaks, CA: Sage Publishing. Mark Henning is a Professor and Coordinator of Math in the School of Technology at Fanshawe College in London, Ontario. He has taught mathematics and engineering subjects at Fanshawe College since 1979, and can be reached via email at MCHenning@fanshawec.ca.